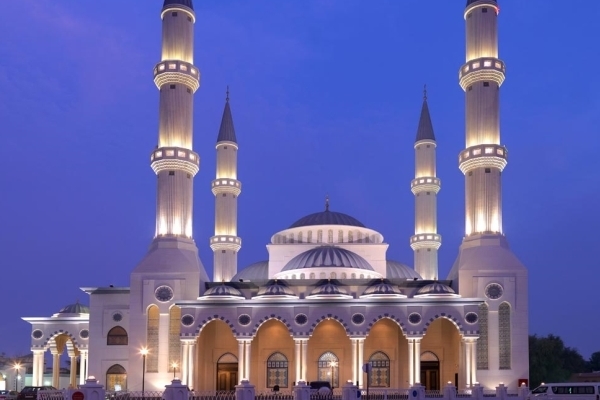 The Al Farooq Omar Bin Al Khattab Mosque & Centre (AFMC) will receive distinguished reciters from different parts of the Middle East during the Holy month of Ramadan. The renowned reciters, from The Kingdom of Saudi Arabia (KSA), Bahrain and Lebanon, will lead Taraweeh prayers every day during Ramadan. As part of its annual Ramadan programme, AFMC will also serve 1,200 meals daily for people to break their fast in a specialized air-conditioned tent located at AFMC. In 2016, the mosque welcomed over 100,000 worshippers during the Holy month. This year it is expecting an even larger number. There will be daily religious lectures by Sheikh Dr Fares Al Mustafa after Asr prayers which will be broadcasted live on YouTube. The Ramadan campaign also includes Instagram episodes of “Ramadan Harvest” series by Sheikh Dr Fares Al Mustafa which will be posted daily. The AFMC also welcomes non-Muslims over Ramadan where visitors get the chance to experience the essence of the Holy month by taking part in the ‘Iftar’ meal alongside Muslims. They also learn about the core values of Islam as well as the culture and traditions of the United Arab Emirates.